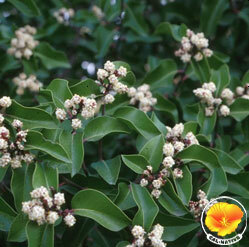 Dense rounded evergreen shrub growing 8-15 ft. tall & wide with creamy flowers between March & May. Small red fruit. Grows well in inland areas and is drought tolerant. Native dry mountain slopes 3-5000' Az, S. Calif into Baja. Leathery rich dark green foliage. Needs additional water in low desert every 2 weeks or afternoon shade. Well drained site. Susc. to verticillium wilt in wet areas.